As a service provider and contractor for technical documentation, software documentation, and software user assistance, I write and create user manuals and online help (online documentation). I typically generate printed manuals and online help from a common text base (“single source publishing”). Do you need a technical writer who creates a user manual or online help for your product? Or would you like to supply both printed documentation and online documentation for the price of one? 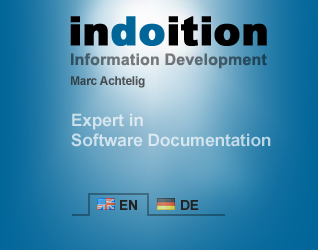 I can create all parts of your technical documentation in the required formats—either in English or in German. All texts will be written in plain, clear language, well-structured, and organized into small reusable modules. Savings multiply with each future release and with each translation. In addition to the cost savings, there’s also the saving of time. Often, manuals and help have been written by developers, product managers, or sales professionals—typically facing tight deadlines. Sometime this workflow is to be followed also in the future, for example, due to its cost effectiveness or due to the fact that the subject needs some very specific knowledge that is hard to acquire. In a case like this, I can revise, improve, and optimize the existing content and transform it into professional, high-quality documentation with as little effort as possible. If you need to supply your documentation in multiple languages, I can find qualified translators, coordinate the translation work, and produce the final documents from the translated source files.